I knew this soap was going to be good but I wasn’t expecting to be superb , due to its slick lather , great skin care and delicious scent , and I’m very glad I got it. Argan oil , jojoba oil , Shea butter , sweet almond oil and a large list of great ingredients on the right proportions and I’ll explain that later. The soap comes on the traditional aluminum tin with 150 grams of soap , which is triple milled. When lathering this soap I don’t treat it any different than any other triple milled soap (MWF , Tabac , Valobra etc). 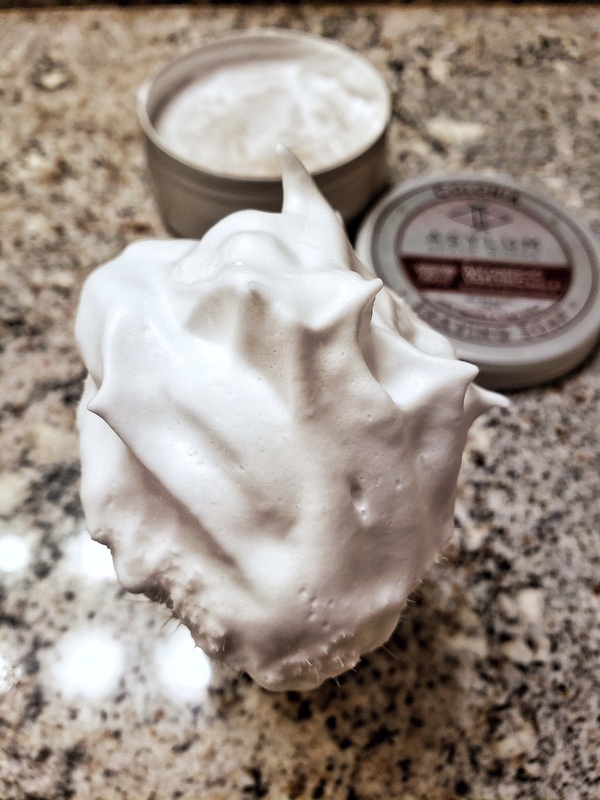 While is a veggie based soap (no palm oil on it , by the way) it’s truly behaves like a tallow based shaving soap , with a thick leather , but very , very slick. It’s lather is ultra slick.I have tried other artisan soaps with most of the same ingredients , and while the lather was protective they weren’t as slick as this one.And this is why I say this soap is formulated with the right proportion of ingredients since it’s extra protective with the skin while having a dense , slick lather. How it behaves reminds me of the old Acca Kappa shaving cream. And then we have it’s scent , which is a refined version of the classic of classics , Acqua di Parma Colonia , which I simply adore.The scent is there during the shave and if you combine it with the same after shave , is like heavenly glory , what else can I say ? Maybe better for the spring/summer than winter , but I don’t care.I love this scent. Yes , it might be more expensive than other soaps but it’s a triple milled soap , has great skin care properties with amazing slickness and smells like heavenly glory. So , as I have started : Viva La Italia. Have been one of my discoveries of this 2018. Slickness is important since I'm a SR shaver only. Not the slickest soap but more than adequate. My main gripe is the lather could be less airy and more dense like my favored tallow soaps. All in all though one of my favorites in both scent and performance. (11-27-2018, 10:54 AM)JHamel Wrote: Slickness is important since I'm a SR shaver only. Not the slickest soap but more than adequate. My main gripe is the lather could be less airy and more dense like my favored tallow soaps. All in all though one of my favorites in both scent and performance. Have you used the new 4.3 formula? This formula of this soap has only been out for a week. Looking forward to this one. The review seems to present an awesome product, but we all expected that. Will this be sold in UK? (11-27-2018, 02:05 PM)Roy Wrote: Will this be sold in UK? I didn't realize this was a new formula. Do you think the new formula is greatly improved? As many of you know, I am an SV Lover to the 9th degree. Can't be more honest than that. Sorry not for you but I'm sure somebody will take it off your hands if you want to unload it. Yes, I think it is a huge improvement. The lather is slicker and creamier and the post shave feel is much better. (11-28-2018, 07:06 AM)zipper Wrote: As many of you know, I am an SV Lover to the 9th degree. How many shaves did you have with it so far? What are you thinking doesn't work for you? If I remember right, you enjoy the performance of Opuntia quite a bit right? I'm wondering if I find any different thoughts after 5 or 10 uses. When I first started using these soaps, there was a break in period on the puck. 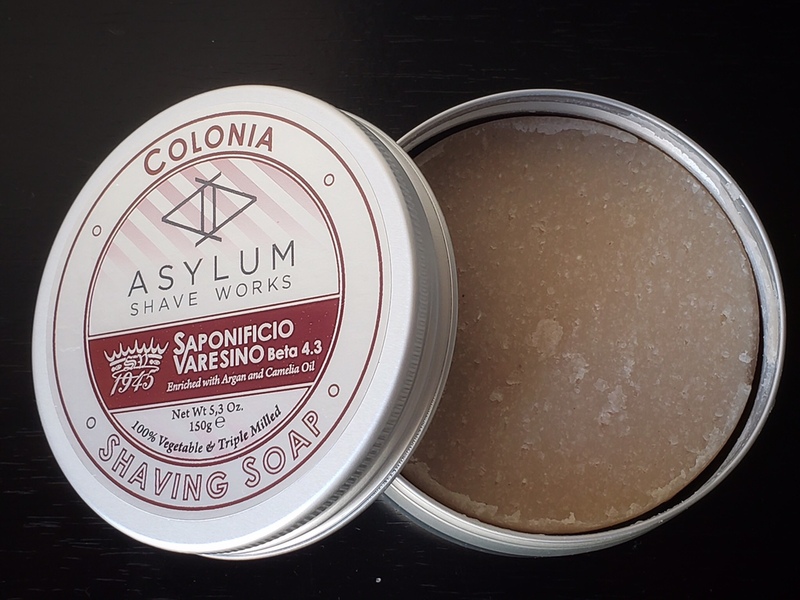 Not so much with the newer soaps but I did shave yesterday with the Colonia soap with the first time. Teiste mentioned in his review that this soap takes lots of water. During my test lather (night before) and during yesterdays shave, I was finding that I got a great hydrated lather with just the bloom water. So with a handful more shaves, I would be more confident to say where I see the new soap standing. My main concern was addressed with the new beta. Colonia 4.1 was lacking density or as I say, in-shave protection. The slickness was still great and the post shave was very favorable, highly softening on my skin. But it didn't quite hold up against protecting me against nicks as much as the other soaps. To Teiste, thanks for your thorough review. As always, many of us enjoy your write ups and great photos along side. 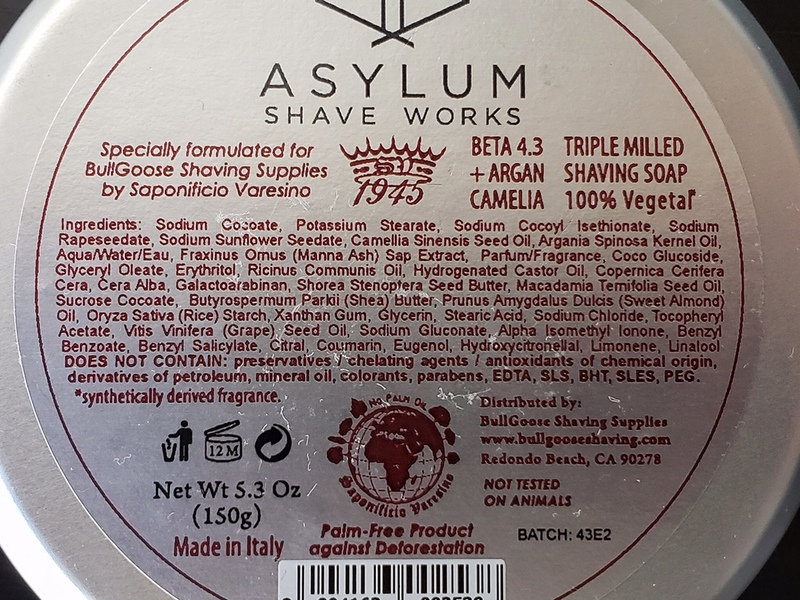 I wanted to ask, what other SV soaps have you used? 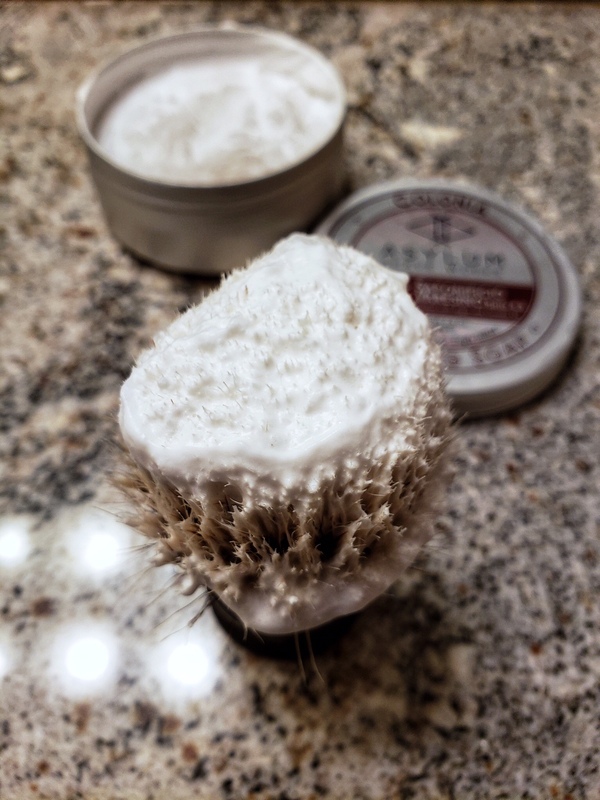 I follow lots of your posts and sotd on IG but you seem to be a lot of the English creams and a few of the other solid standing Euro hard soaps. To Phil, although this is the soap thread, I have to say I love the fact that you went for the aftershave in this run. This is such a wonderful scent and on top of it, having a huge bottle of it that will last a while is awesome. If I recall to the best of my ability, reading peoples thoughts on the various SV aftershaves, there is about 1/3 of people who really seem to enjoy them. Half of people like them but there seem to be a lot of people who do not enjoy them for whatever reason. Maybe the balsam texture or the lack of high alcohol burn but I thoroughly enjoy most of them. A few I enjoy more than some of the soaps. The aftershave smells awesome and I wish we could have had it a couple years ago. I'm sure it was an expensive addition so kudos on the commission. I got three shaves on it. I'll have to wait a few days b/4 I can try it again. As I write this, about 7 hrs. after I shaved, my face is slightly irritated. Hello Zach , glad to see you here too , my friend. 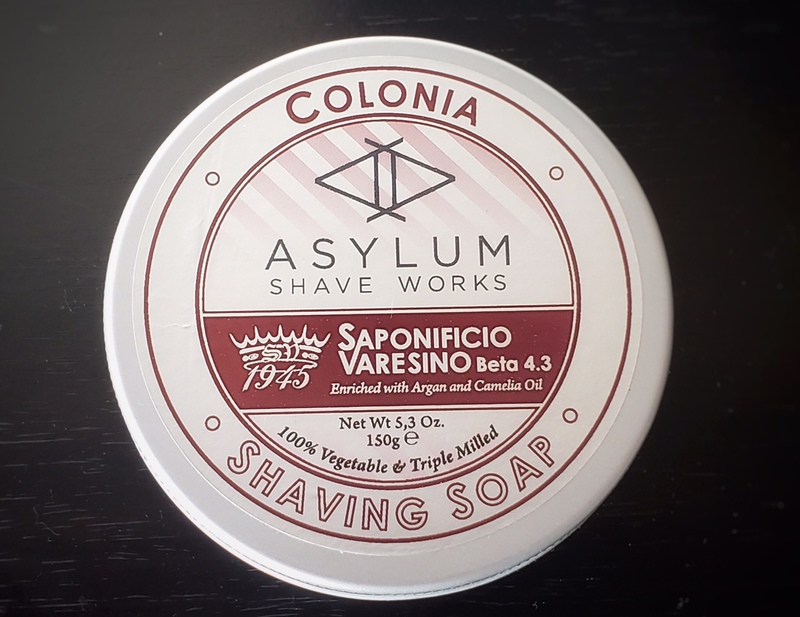 This is the second Saponificio Varesino that I have tried , after the Cosmo one , which is not as good (skin and scent wise) than this one IMHO , of course. And yes , you know that these days I prefer Euro soaps and creams over "artisan" ones. I tried this soap today and was very happy with it. Post shave was quite easy and left my face smooth after 2 pass shave. Can't say I like it any better than Flying Mango just yet because that is my favorite SV so far. (11-27-2018, 12:32 PM)bullgoose Wrote: Have you used the new 4.3 formula? This formula of this soap has only been out for a week. I agree with Phil. I expected the performance to be similar to the old formula (4.1), but it is noticeably different. I lathered it just like I have always lathered my 4.1, of which I still have a little remaining. The lather came out creamier with more shine, and it was slicker and more moisturizing. By comparison, the 4.1 usually takes on a more fluffy character. I still like the 4.1 a lot, but I love the 4.3. One place where the 4.1 might be better is scent. When I smell each back to back, they are close, but not identical. I will have to give the 4.3 some time as a soap's scent can sometimes change with time as you get into it a little and as it ages. Interesting review, thanks for taking the time.